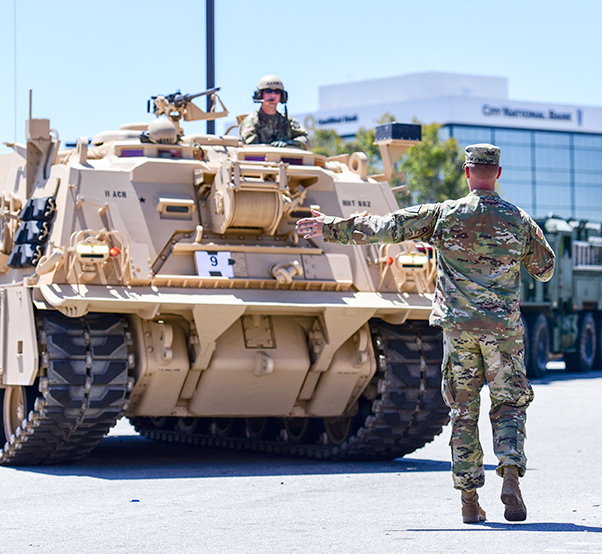 A Soldier assigned to the 11th Armored Cavalry Regiment, Fort Irwin directs an armored vehicle during the annual Armed Forces Day Parade in Torrance, Calif. The City of Torrance hosted its 58th Armed Forces Day Celebration and Parade to honor the sacrifices of our nation’s military. 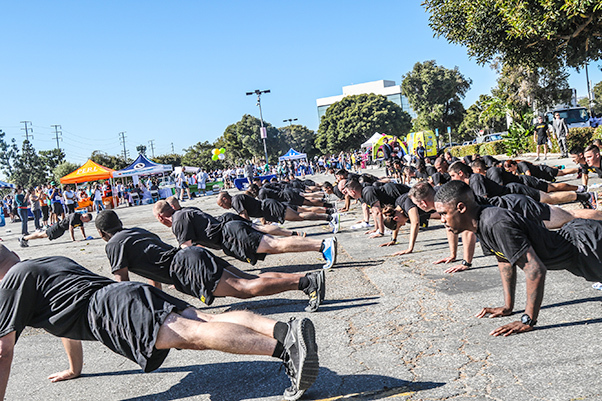 TORRANCE, Calif.–The city of Torrance hosted its 58th Annual Armed Forces Day Celebration in honor of the military May 19-21. The weekend-long event included a concert, parade and military displays. Each year, Torrance recognizes one of four military branches as the honored service. 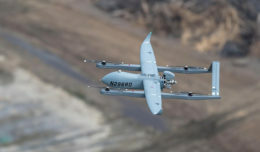 This year it was the Air Force, with Gen. Ellen Pawlikowski, the commander of Air Force Materiel Command at Wright-Patterson Air Force Base, Ohio, as the parade’s grand marshal. The Air Force Band of the Golden West performed at the local theater, and a military exhibit was on display every day of the Armed Forces Day Celebration. The exhibit included armored vehicles, aircraft, support equipment and more. Thousands of people, including civilians, veterans and service members gathered along Torrance Boulevard to enjoy the parade. A spectater salutes as the new Army recruits and recruiters march by during the annual Armed Forces Day Parade in Torrance, Calif. The City of Torrance hosted its 58th Armed Forces Day Celebration and Parade to honor the sacrifices of our nation’s military. 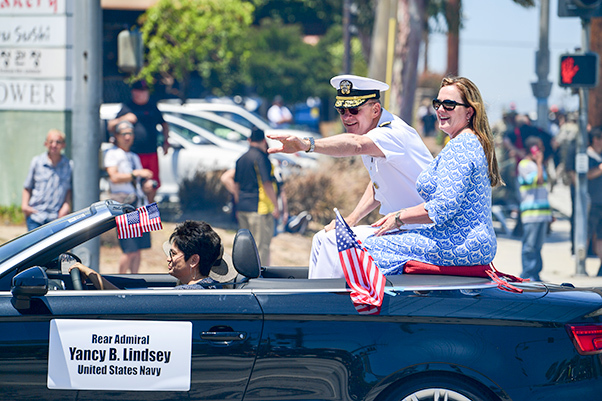 Rear Adm. Yancy B. Lindsey, the Navy Region Southwest commander, touched on the importance of the parade in bringing the civilian and military community together, to show service members and their families that they are appreciated. ”It shows the importance of service to your nation, in uniform or out. Our families need to know that the public appreciates what they do … service members serve, but we know our families serve too,” Lindsey said. Lindsey also toured the event locations and thanked service members along the way. 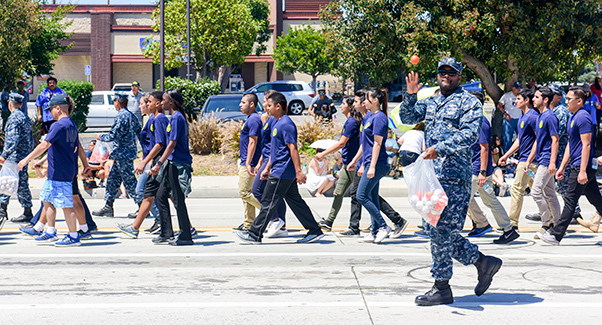 A Navy recruiter tosses a ball to the spectators during the annual Armed Forces Day Parade in Torrance, Calif. The City of Torrance hosted its 58th Armed Forces Day Celebration and Parade to honor the sacrifices of our nation’s military. 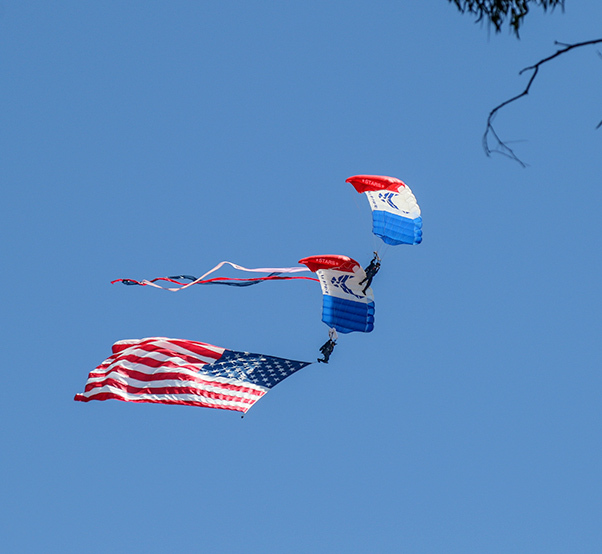 During the parade, World War II-era military aircraft flew overhead, low enough for the public to admire them, and Air Force parachutists jumped from contemporary military aircraft and landed on the parade route. 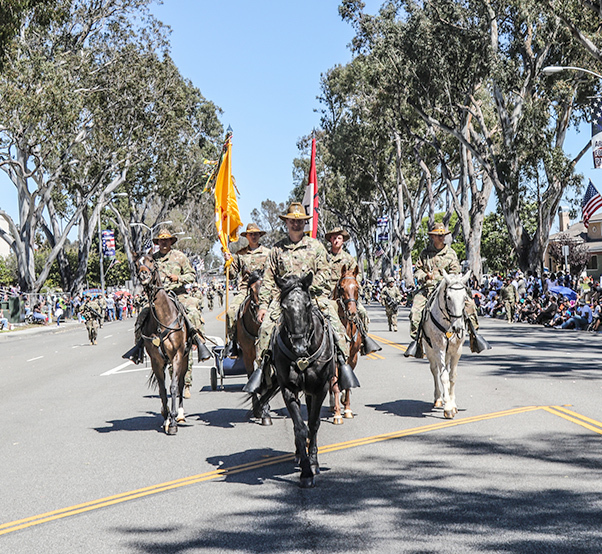 The Torrance Armed Forces Day parade is the longest running Armed Forces Day parade in the nation. In 1960, Mayor Albert Isen began the parade to “increase public respect and understanding of the military service, and promote civic-military relationships”. Coast Guard Rear Adm. Todd Sokalzuk, the 11th Coast Guard District commander, echoed the sentiments of Mayor Isen, “This is a fantastic event. 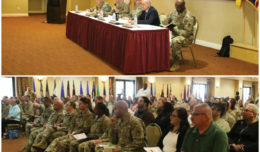 It’s a good opportunity to tell the community what we do in the military, and also it’s a chance for all the services to come together and get to know each other. David Heard, a civilian contractor, shows a visitor an Air Force X-1 super car during the annual Armed Forces Day Celebration in Torrance, Calif. The City of Torrance hosted its 58th Armed Forces Day Celebration and Parade to honor the sacrifices of our nation’s military. 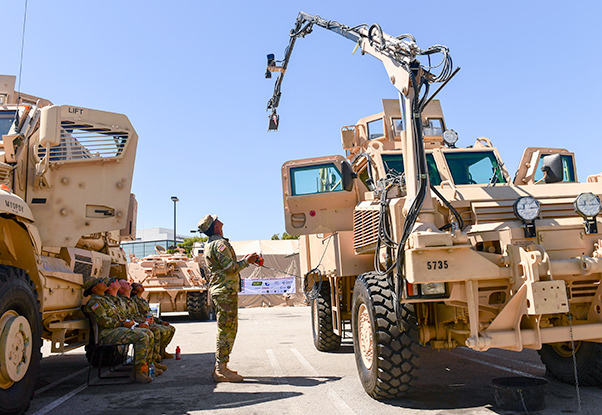 A Soldier assigned to the 11th Armored Cavalry Regiment, Fort Irwin controls a robotic arm during the annual Armed Forces Day Celebration in Torrance, Calif. The City of Torrance hosted its 58th Armed Forces Day Celebration and Parade to honor the sacrifices of our nation’s military. U.S. Army Brig. 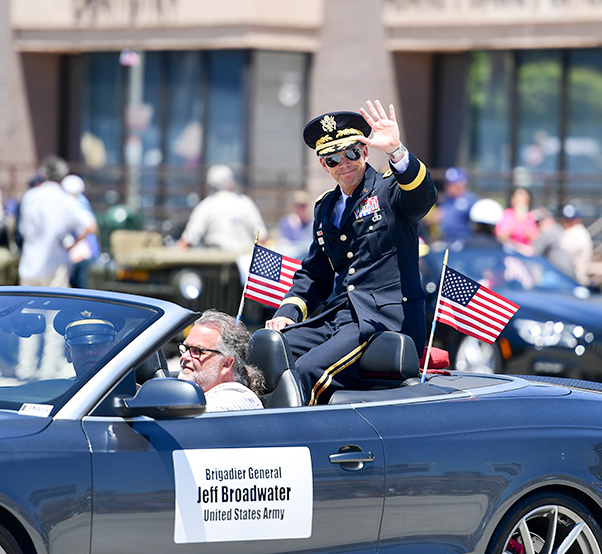 Gen. Jeff Broadwater waves during the annual Armed Forces Day Parade in Torrance, Calif. The City of Torrance hosted its 58th Armed Forces Day Celebration and Parade to honor the sacrifices of our nation’s military. 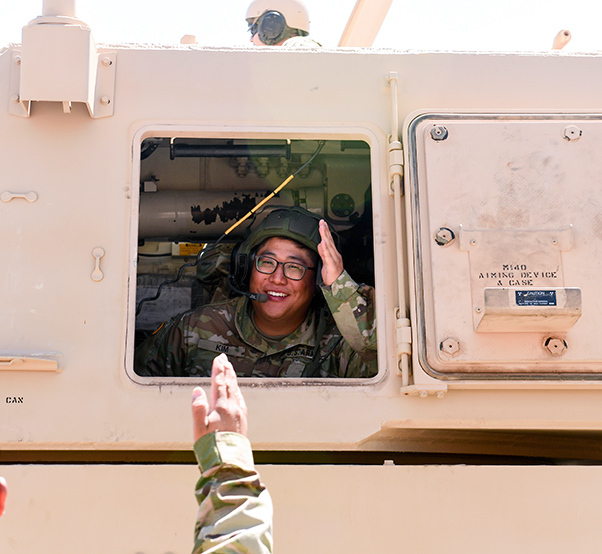 A Soldier assigned to the 11th Armored Cavalry Regiment, Fort Irwin waves to the crowd during the annual Armed Forces Day Parade in Torrance, Calif. The City of Torrance hosted its 58th Armed Forces Day Celebration and Parade to honor the sacrifices of our nation’s military. 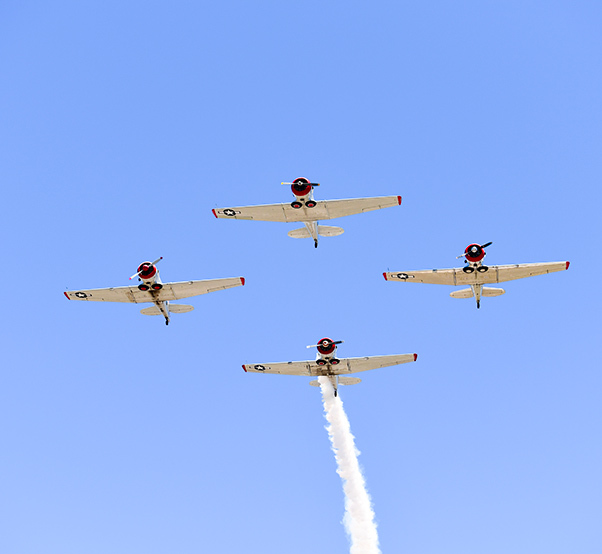 Warbirds fly over during the annual Armed Forces Day Parade in Torrance, Calif. The City of Torrance hosted its 58th Armed Forces Day Celebration and Parade to honor the sacrifices of our nation’s military. Rear Adm. Yancy B. Lindsey, Navy Region Southwest Commander, waves during the annual Armed Forces Day Parade in Torrance, Calif. The City of Torrance hosted its 58th Armed Forces Day Celebration and Parade to honor the sacrifices of our nation’s military. Japanese-American veterans of World War II and a boy portraying a World War II Soldier participate in the annual Armed Forces Day Parade in Torrance, Calif. The City of Torrance hosted its 58th Armed Forces Day Celebration and Parade to honor the sacrifices of our nation’s military. 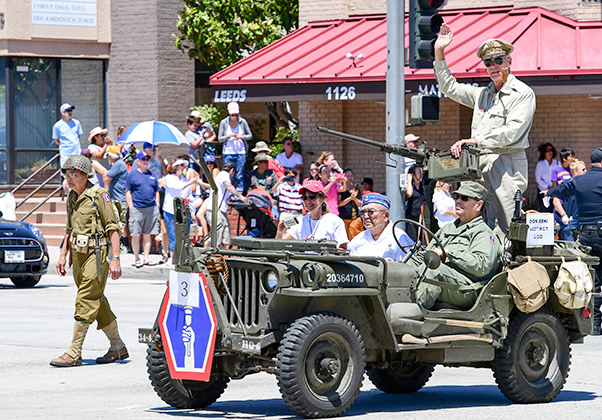 World War II veterans participate in the annual Armed Forces Day Parade in Torrance, Calif. The City of Torrance hosted its 58th Armed Forces Day Celebration and Parade to honor the sacrifices of our nation’s military. U.S. Army COL Joseph Clark, commander, 11th Armored Cavalry Regiment, and SGM Reginald Parham, operations noncommissioned officer in charge, ride in a WWII era M2 Halftrack, during Torrance’s 58th Annual Armed Services Day Parade, May 20, 2017. 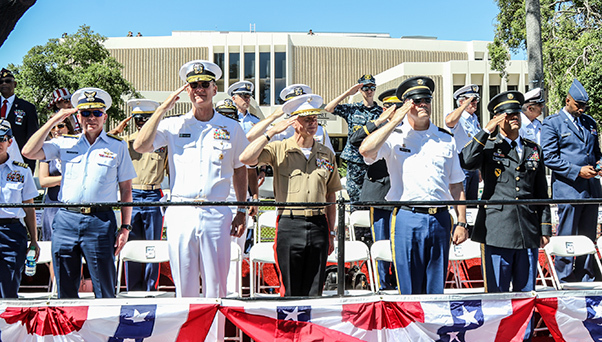 For more than five decades, the city of Torrance has hosted a three-day celebration as a tribute to the men and women in uniform, to honor and thank the men and women of our nation’s Armed Forces. 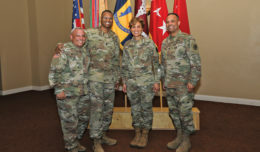 Retired U.S. Army LT. COL. 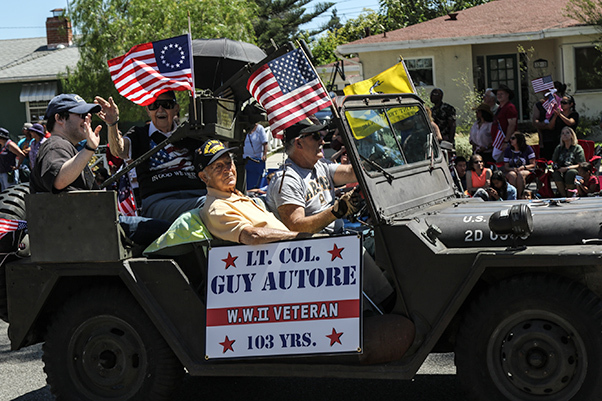 Guy Autore, a 103 year-old veteran of WWII, rides in a WWII era Jeep during Torrance’s 58th Annual Armed Services Day Parade, May 20, 2017. For more than five decades, the city of Torrance has hosted a three-day celebration as a tribute to the men and women in uniform, to honor and thank the men and women of our nation’s Armed Forces. The U.S. Air Force Academy parachute team, Wings of Blue, perform aerial maneuvers during Torrance’s 58th Annual Armed Services Day Parade, May 20, 2017. For more than five decades, the city of Torrance has hosted a three-day celebration as a tribute to the men and women in uniform, to honor and thank the men and women of our nation’s Armed Forces. A combined armed services Honor Guard, representing each branch of the Armed Forces, led the way during Torrance’s 58th Annual Armed Services Day Parade, May 20, 2017. For more than five decades, the city of Torrance has hosted a three-day celebration as a tribute to the men and women in uniform, to honor and thank the men and women of our nation’s Armed Forces. 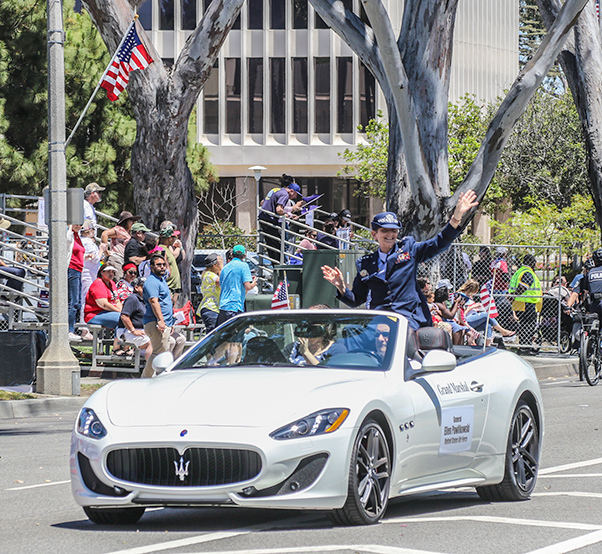 U.S. Air Force GEN Ellen Pawlikowski, Grand Marshal of Torrance’s 58th Annual Armed Services Day Parade, waves to the crowd as her vehicles approaches the officiating grand stand, May 20, 2017. For more than five decades, the city of Torrance has hosted a three-day celebration as a tribute to the men and women in uniform, to honor and thank the men and women of our nation’s Armed Forces. 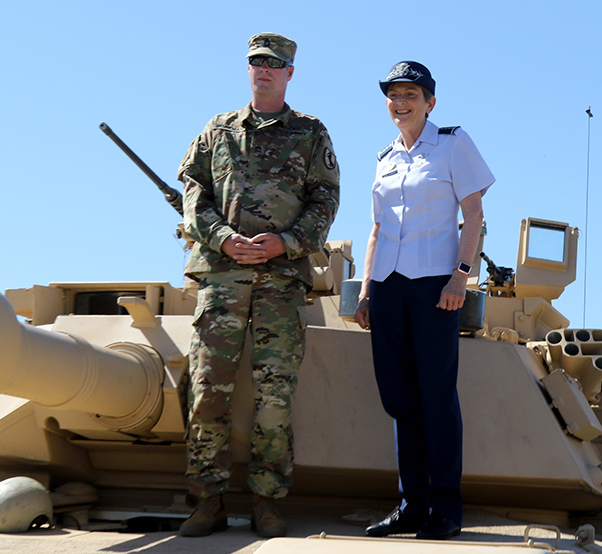 U.S. Air Force Gen. Ellen Pawlikowski, Grand Marshal for the 58th Torrance Armed Forces Day Parade, is briefed on the specifics of a Blackhorse M1A1 Abrams tank by SFC Ian Workman, Gunslinger Troop, 2nd Squadron, 11th Armored Cavalry Regiment, May 20, 2017. For more than five decades, the city of Torrance has hosted a three-day celebration as a tribute to the men and women in uniform, to honor and thank the men and women of our nation’s Armed Forces. 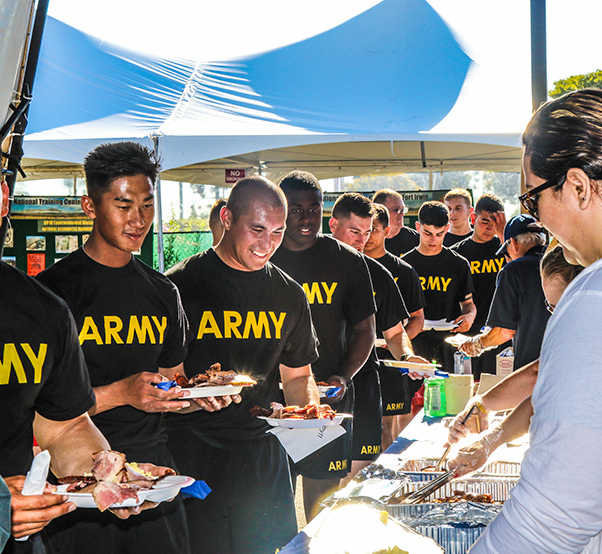 Troopers from the 11th Armored Cavalry Regiment are treated to breakfast by the Bob Hope USO after the Torrance Armed Forces Day 5K Run, May 20, 2017. For more than five decades, the city of Torrance has hosted a three-day celebration as a tribute to the men and women in uniform, to honor and thank the men and women of our nation’s Armed Forces. 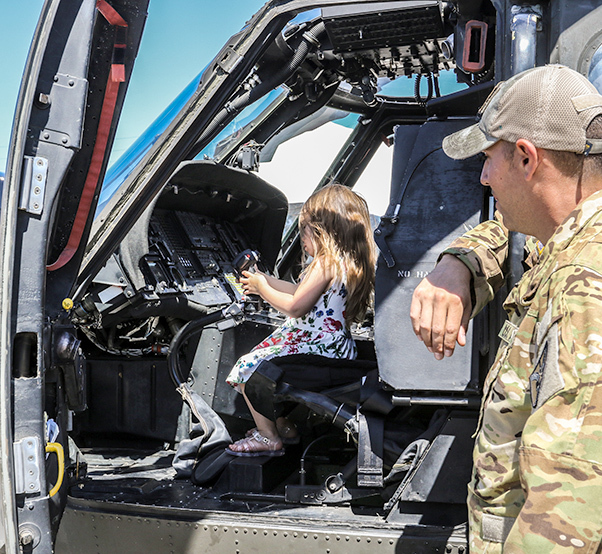 U.S. Army SGT Robert Taylor, Alpha Company, 2916th Aviation Battalion, 916th Support Brigade, puts a future aviator in the cockpit of his UH-60 Blackhawk helicopter at Torrance’s 58th Annual Armed Forces Day, May 19, 2017. For more than five decades, the city of Torrance has hosted a three-day celebration as a tribute to the men and women in uniform, to honor and thank the men and women of our nation’s Armed Forces. 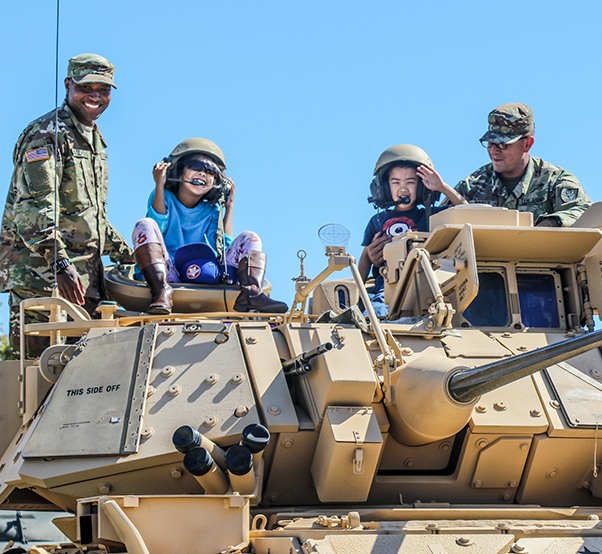 Troopers from Easy Troop, 2nd Squadron, 11th Armored Cavalry Regiment, share the intricacies of their M2 Bradley Fighting Vehicle with children attending Torrance’s 58th Annual Armed Forces Day, May 19, 2017. For more than five decades, the city of Torrance has hosted a three-day celebration as a tribute to the men and women in uniform, to honor and thank the men and women of our nation’s Armed Forces. Troopers of the 11th Armored Cavalry Regiment, Fort Irwin, Calif., conduct push-ups upon completion of Torrance’s 5K run, prior the city’s 58th Annual Armed Forces Day Parade, May 20, 2017. For more than five decades, the city of Torrance has hosted a three-day celebration as a tribute to the men and women in uniform, to honor and thank the men and women of our nation’s Armed Forces. 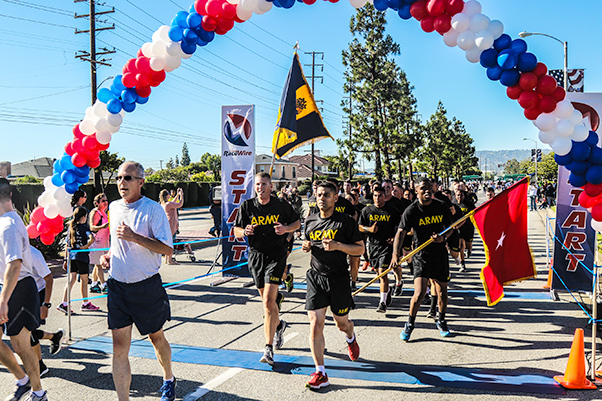 Troopers assigned to the 11th Armored Cavalry Regiment, Fort Irwin, Calif., participate in the city of Torrance’s Armed Forces Day 5K Run prior to the 58th Annual Armed Forces Day Parade, May 20, 2017. For more than five decades, the city of Torrance has hosted a three-day celebration as a tribute to the men and women in uniform, to honor and thank the men and women of our nation’s Armed Forces. Elements of the 11th Armored Cavalry Regiment participate in Torrance’s 58th Armed Forces Day Parade, May 20, 2017. 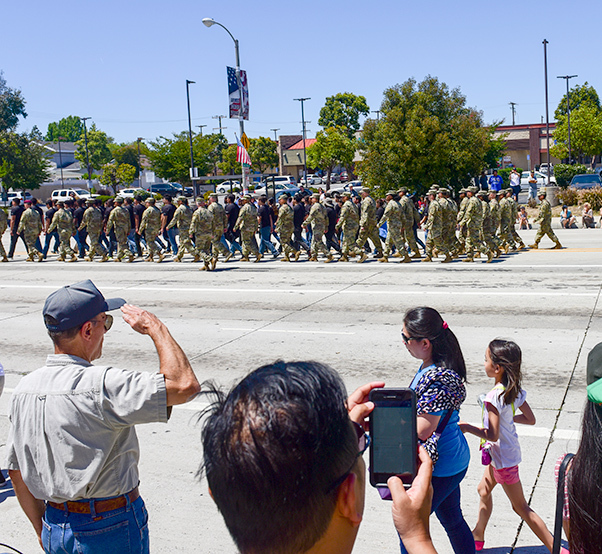 For more than five decades, the city of Torrance, Calif. has hosted an Armed Forces Day Parade as a tribute to the men and women in uniform, which has become a deep-rooted tradition throughout the community. 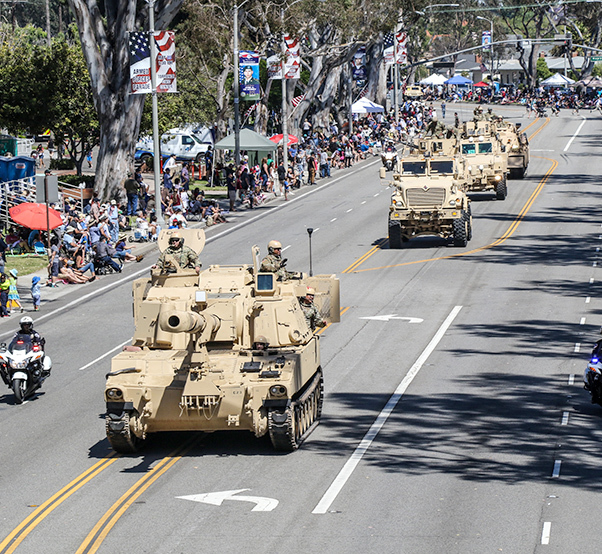 Vehicles from the 11th Armored Cavalry Regiment and 916th Support Brigade, Fort Irwin, Calif., roll down the main street of Torrance during the city’s 58th Annual Armed Forces Day Parade, May 20, 2017. 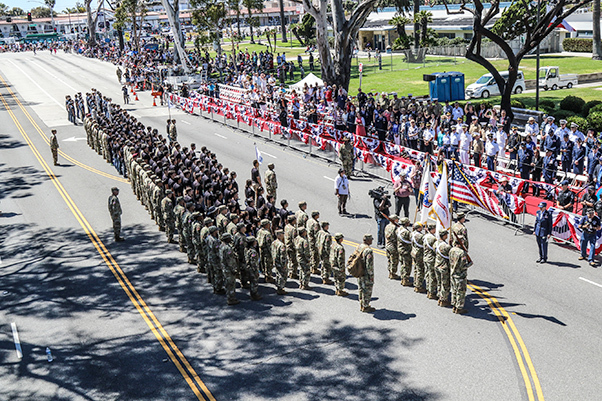 For more than five decades, the city of Torrance, Calif. has hosted an Armed Forces Day Parade as a tribute to the men and women in uniform, which has become a deep-rooted tradition throughout the community. Candidates and Soldiers from the U.S. Army Los Angeles Recruiting Battalion participate in a mass swearing in ceremony during Torrance’s 58th Annual Armed Forces Day Parade, May 20, 2017. 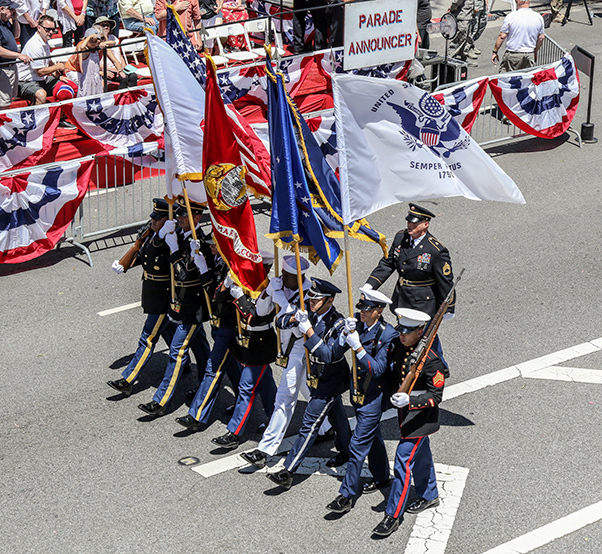 For more than five decades, the city of Torrance, Calif. has hosted an Armed Forces Day Parade as a tribute to the men and women in uniform, which has become a deep-rooted tradition throughout the community. A combined services Honor Guard leads Torrance’s 58th Annual Armed Forces Day Parade to promote unity and patriotism, May 20, 2017. 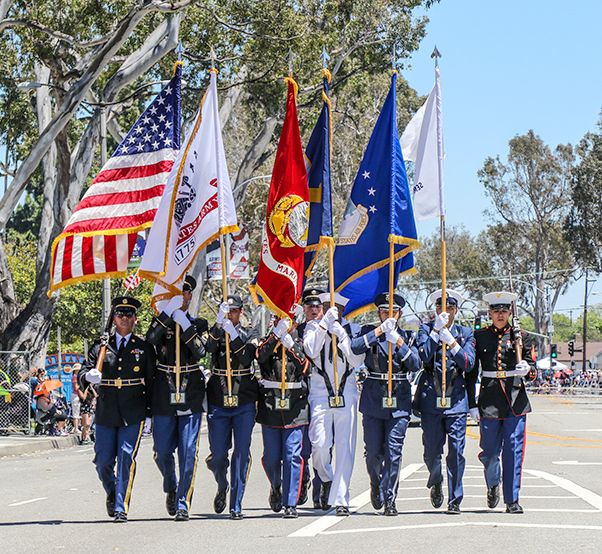 For more than five decades, the city of Torrance, Calif. has hosted an Armed Forces Day Parade as a tribute to the men and women in uniform, which has become a deep-rooted tradition throughout the community. The officiating party render salutes as the national colors pass by the grandstand during Torrance’s 58th Annual Armed Forces Day Parade, May 20, 2017. 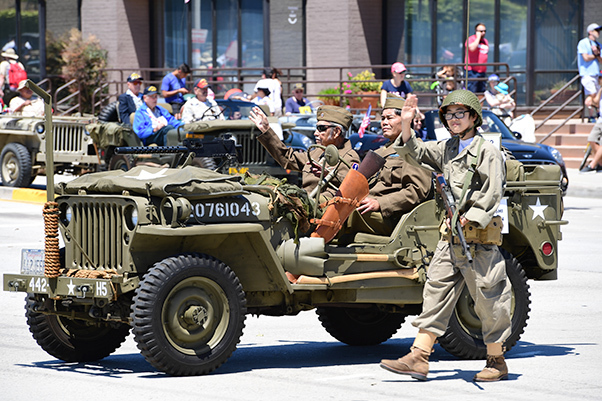 For more than five decades, the city of Torrance, Calif. has hosted an Armed Forces Day Parade as a tribute to the men and women in uniform, which has become a deep-rooted tradition throughout the community. U.S. Army CSM Michael Stunkard, senior enlisted advisor, 11th Armored Cavalry Regiment, renders honors during Torrance’s 58th Armed Forces Day Parade, May 20, 2017. 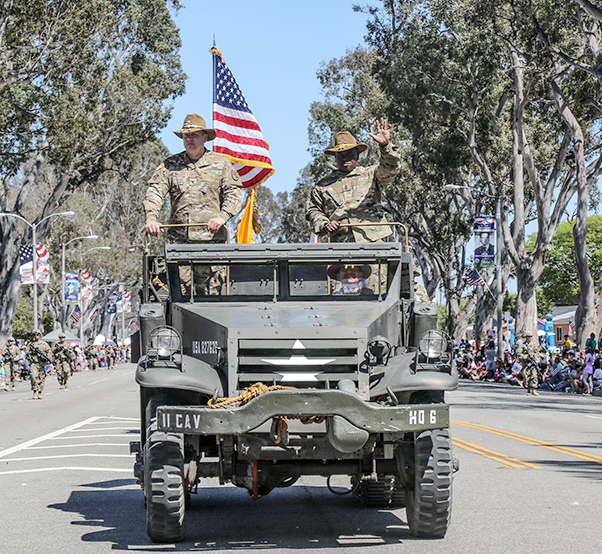 For more than five decades, the city of Torrance, Calif. has hosted an Armed Forces Day Parade as a tribute to the men and women in uniform, which has become a deep-rooted tradition throughout the community. 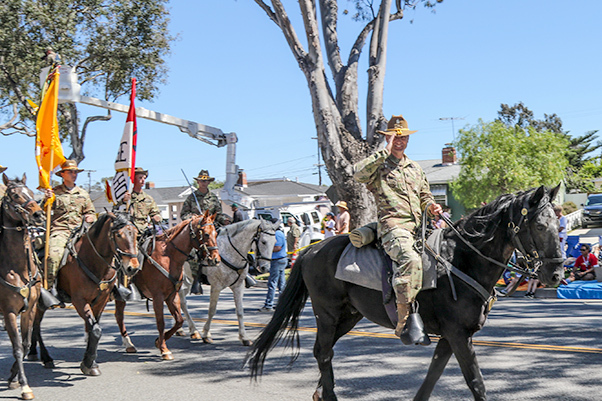 U.S. Army CSM Michael Stunkard, senior enlisted advisor, 11th Armored Cavalry Regiment, takes to horseback while leading Troopers in Torrance’s 58th Annual Armed Forces Day Parade, May 20, 2017. 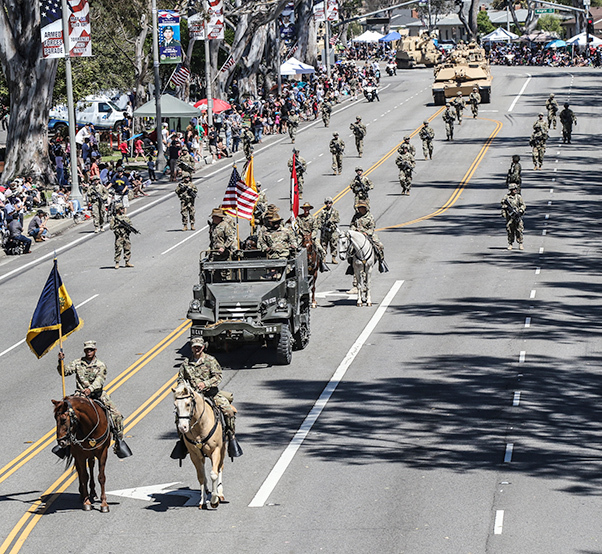 For more than five decades, the city of Torrance, Calif. has hosted an Armed Forces Day Parade as a tribute to the men and women in uniform, which has become a deep-rooted tradition throughout the community. 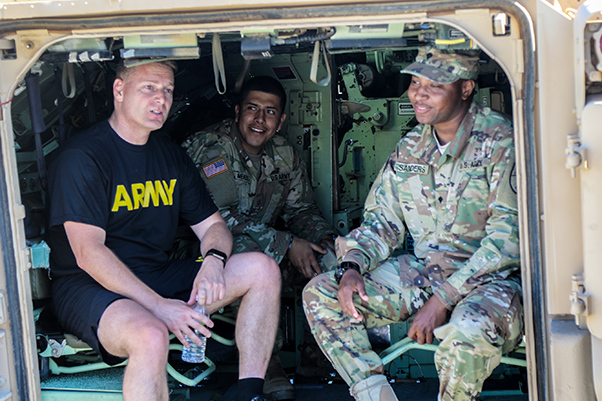 U.S. Army CSM Michael Stunkard, senior enlisted advisor, 11th Armored Cavalry Regiment, visits with PFC Nahum Mendez and SPC Van Sanders, Easy Troop, 2nd Squadron, 11th Armored Cavalry Regiment after the Torrance Armed Forces Day 5K Run, May 20, 2017. For more than five decades, the city of Torrance has hosted a three-day celebration as a tribute to the men and women in uniform, to honor and thank the men and women of our nation’s Armed Forces. U.S. Army Staff Sgt. 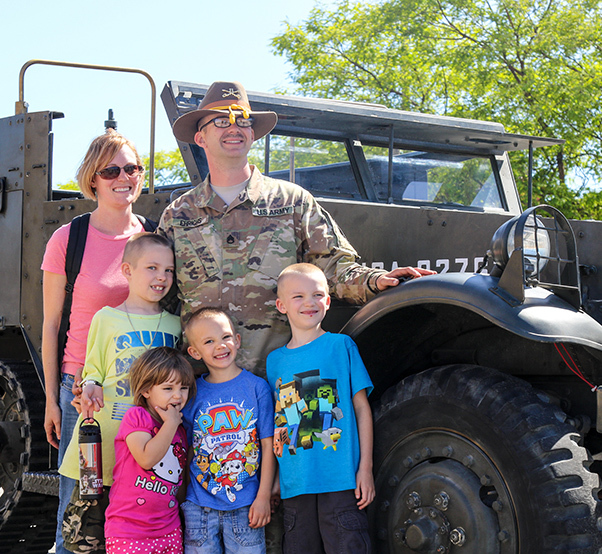 Daniel Ehrichs, Maintenance Troop, Regimental Support Squadron, 11th Armored Cavalry Regiment, enjoys a moment with his family on a the Blackhorse Regiment’s M2 Halftrack, a World War II era vehicle, at Torrance’s 58th Annual Armed Forces Day, May 19, 2017. For more than five decades, the city of Torrance has hosted a three-day celebration as a tribute to the men and women in uniform, to honor and thank the men and women of our nation’s Armed Forces.